Robert Manners: Depression + Insecurity = Dollhouse Obsession ? 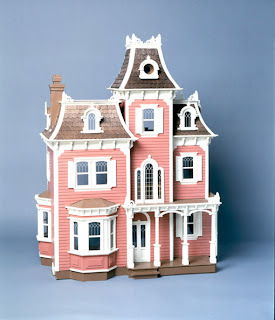 Depression + Insecurity = Dollhouse Obsession ? 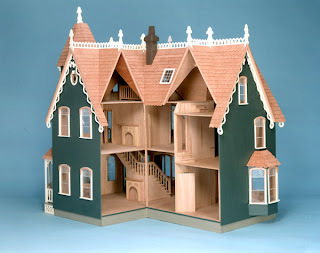 I've always been fascinated by dollhouses, as you might remember from this post not so long ago; but my fascination seems only to turn to obsession when I'm unhappy (as I was when I wrote that post and was on another dollhouse obsession). And now here I am, my meds going a little flooey again, my employment shakey (I still haven't heard back from the job I applied for, yea or nay, and am on tenterhooks... which aren't very comfortable, ask any dead cow), and my general outlook just a little unhappy... and I've gotten sucked into the world of dollhouses on eBay again. Of course, what I'd prefer is to have one pre-made, but those things cost like you wouldn't believe. The kits are expensive enough (about $300 for the Garfield down to about $100 for the Willow), and don't even come with glue and paint; the assembled and painted versions cost two or three times as much, with absolutely crippling freight charges. The worst is that I totally cannot afford this right now. I just spent over $700 getting my car registration taken care of (I put it off for a whole year, so had to pay twice the usual rate, and had a bunch of parking tickets on it as well), and yesterday got dinged another $450 because something went astray in the engine (the PCV hose and valve, whatever they might be). Plus, before I got locked into this dollhouse obsession, I've been working on assembling this year's Halloween costume. I can't decide if I'm going to be a pirate or a vampire, or maybe a vampirical pirate, but I'm going for a very Gothic/eighteenth-century look that incorporates a few pieces from last year's costume (in which I looked haaaaawt!) The purchases for that folly have so far included a $200 brocade coat (totally not worth that much, but it seemed the better buy at the time...the other period coats I found were upward of $275), a $60 flying dragon sword, and another $60 for a custom made shirt... so far I've spent more sprucing up last year's costume than I spent on last year's costume itself! 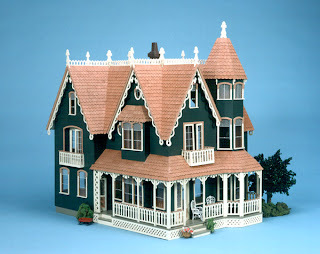 Well, back to topic: I have been placating myself with small dollhouse purchases, furniture kits and whatnot to practice on, and keeping a passive eye on the larger house auctions. 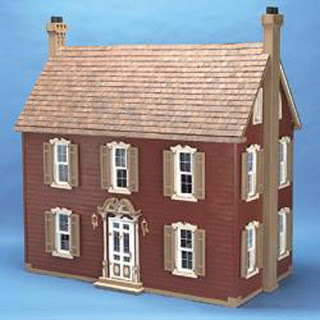 Hopefully, if I take my time and don't let myself get too hasty about bidding, as I did on the Marx dollhouses last year, I might actually come up with a bargain or two. 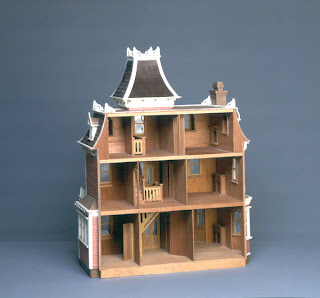 Though I also have to remember that I never touch my Marx dollhouses anymore. They've been down in the basement since last July and are just sort of in the way, now. I don't even have any kids around of an age to play with them (too sharp for toddlers, too dull for teens), or I'd consider giving them away. On the other hand, scale miniatures are a different battle from vintage toys. 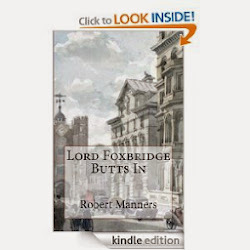 There is absolute endless variety. 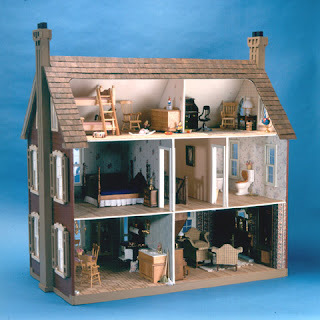 People work on single dollhouses for their whole lifetimes. And as hobbies go, after the initial "real estate" expense, it's not a terribly costly pastime... certainly not as costly as my Suzanne Somers jewelry fetish. Well, anyways, I'd better get on with my day. Speaking of basements, I have a lot of stuff in the hallway that needs to be hauled downstairs, and I think that while I'm down there I'll take a stab at organizing my drag room. Now that I'm in almost-complete-but-still-nominally-semi-retirement from drag (the occasional Court appearance, and the upcoming Fall Follies, are all I intend to do until I can get back into a sixteen), I need to get that whole area tidied up so I can find things when I need them but so that they're not taking up so damned much space.